How do I view a course as a test student using Student View? You can view a course the same way that your students view your course through Student View. Enabling Student View creates a Test Student in your course. You can also activate Student View in your Course Settings. 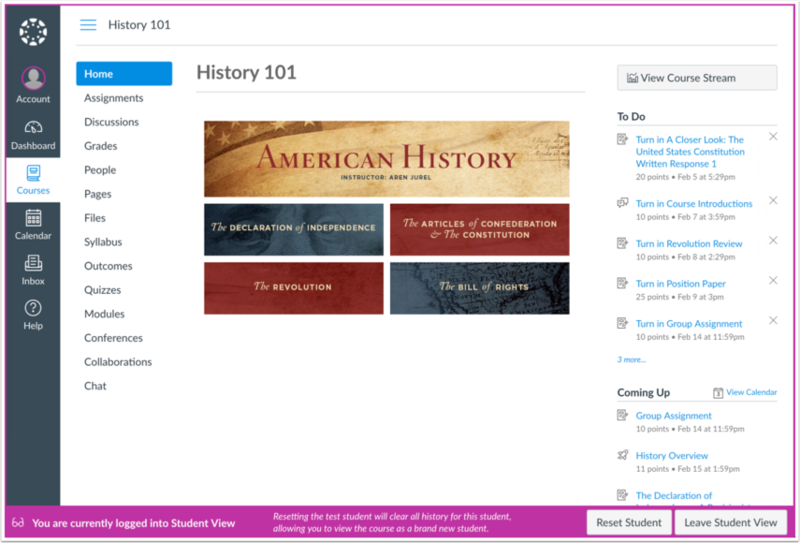 To see the student's perspective on Canvas, use Student View to view the course, post and reply to discussions, submit assignments, view grades, view people, view pages, view the syllabus, view quizzes, view the calendar, and view the scheduler (if enabled). You can reset Test Student data at any time; however, Test Student activity that involves interactions with other students cannot be removed, such as discussion replies. Each Canvas course has a separate Test Student account. Whenever you move to a new course you will need to enable Student View for that course. Submissions and scores for the Test Student do not affect course analytics. You can only view the course layout as it is seen by your students. You cannot view student-specific information, such as conversations between students. Student View cannot be used with MasteryPaths in a course. Once you activate Student View, the Test Student is shown at the end of the Gradebook and SpeedGrader and is automatically added to every section in your course. If you want to remove the test student completely, you will have to remove the test student from your section enrollments. In the couse home page sidebar, click the Student View button. You can now view the course as a student user would see it. For example, students cannot see the Settings navigation link like instructors can. You will know if you are in Student View because of the persistent box on the bottom of the screen indicating you are logged into Student View. You can also reset the Test Student by clicking Reset Student. This action will clear all activity that does not include any student interaction. For example, if you created an assignment and submitted it as the Test Student but then forgot to add a certain submission type, you can click the Reset Student button and submit the assignment again as the Test Student. To return to your course in the instructor view, click the Leave Student View button. Previous Topic:How do I view course statistics? Next Topic:How do I reset course content? Table of Contents > Settings > How do I view a course as a test student using Student View? Re: What do students see?